An inventor has displayed his fantastic creation in a video that defies belief. James Hobson has created a fantastic exoskeleton which gives him extraordinary strength, and the ability to lift objects that would be too heavy for humans. 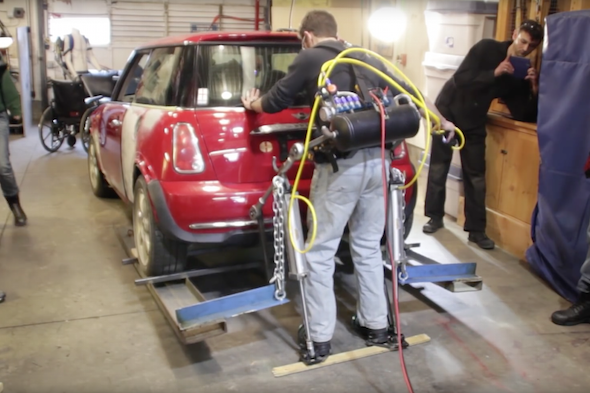 In this video, Hobson uses the pneumatic suit to lift a Mini Cooper – a car which weighs around 1,180kg. By attaching the car to the struts on the legs of the specially-made suit, Hobson is able to lift the vehicle without having to use his upper body – lowering the risk of something going wrong and an injury being incurred. This isn't the first amazing invention that Hobson has created. His YouTube channel showcases some of his other builds, including a Star Wars R2-D2 pumpkin projector, and X-Men Wolverine-style metal claws. The technology behind exoskeletons has been rapidly improving, with disabled people being helped out by the additional strength that they can provide.